The pomegranates are in season here in northern California. These delicious fruits are a great source of potassium, and pomegranate juice contains antioxidants that will help to protect your blood lipids from oxidation. Pomegranate juice has also been known to prevent prostate cancer and helps to prevent plaque build up in your arteries. Pomegranate seeds also are a good source of fiber. Here are some great pomegranate recipes. Whirl 1-1/2 to 2 cups of seeds in a blender or food processor until liquefied. Pour through a cheesecloth-lined wire strainer and drain. Refrigerate for up to 3 days or freeze up to 6 months. *One medium pomegranate (about 9 ounces) yields 1/2 cup juice. Pomegranate seeds add lively color, flavor and crunch to this ginger-spiked salad. 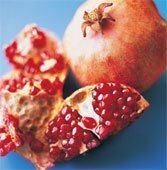 Separate seeds from skin and pulp of pomegranate (you should have about 3/4 cup seeds); reserve. To make dressing, mix lemon juice and next 6 ingredients; whisk in oil. Reserve. On a large serving platter, arrange endive leaves like spokes with tips pointing out. Toss papaya with 1 tablespoon dressing; reserve. Toss lettuce with remaining dressing; mound over endive leaves. Top with reserved papaya; sprinkle with pomegranate seeds, then with green onion. In a medium mixing bowl, combine the yogurt, pomegranate juice, scallions, cilantro, and salt. Gently fold in all but 2 tablespoons of the pomegranate seeds. Place in serving bowl and garnish with mint and seeds. Chill for 30 minutes.